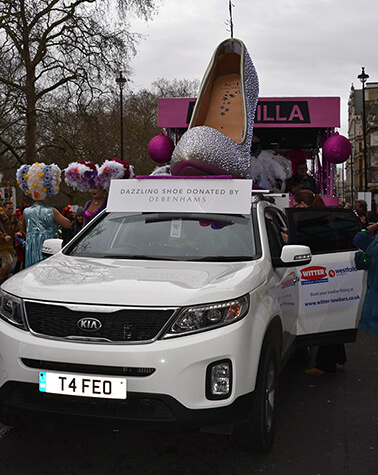 This year we sponsored an amateur theatre company, Encore Theatre Company (Registered Charity No 1157719) who had been asked to represent the London Borough of Hillingdon in this year's London New Year Parade 2018, where they came in 5th position. Since 1997 all of London's boroughs, along with the City of Westminster, are invited to enter the parade with some form of entertainment based on the years theme and to celebrate the great diversity of London. Encore started life as a Cabaret group, the brainchild of Annette (Netta) Sands. In the late 1980's she put together a group of singers and entertainers to perform cabaret shows in support of various charitable causes. For over a decade Encore performed, literally here, there and everywhere, in golf clubs, schools, old people's homes, even at boxing clubs and at charity events in various local venues including at the Compass Theatre, where we are now based. All the profits from Encore's shows went to charity – either by way of a donation or through staging shows for specific causes. Have you recently bought a new car or are just thinking about fitting a towbar to your current vehicle?